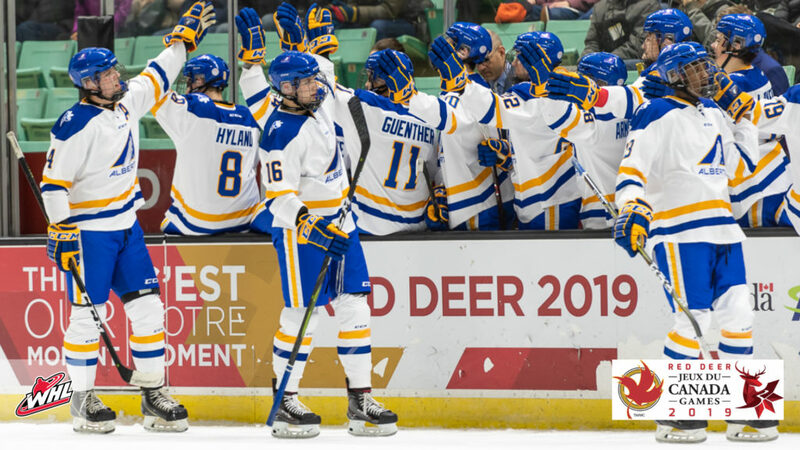 Friday saw the conclusion of the male hockey tournament at the 2019 Canada Winter Games with Dylan Guenther, Keagan Slaney and Matt Smith all claiming bronze with Alberta. Alberta claimed bronze on home soil Friday afternoon with a 12-0 win over Saskatchewan. 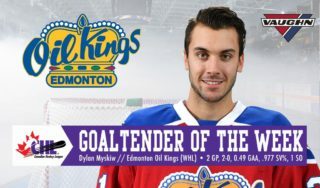 Matthew Savoie had a hat trick and five points, Dylan Guenther (Edmonton, Alta./Edmonton Oil Kings) had a pair of goals and five points, and Craig Armstrong (Airdrie, Alta./Prince George Cougars) had a pair of goals and four points to lead the offensive charge. Drew Sim (Tees, Alta./Vancouver Giants) stopped all 37 shots for the shutout, stopping 11 shots in the first, 16 in the second, and 10 in the third. 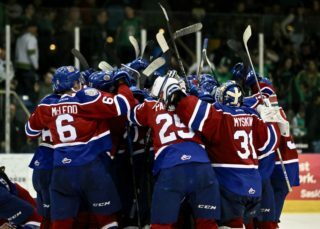 Owen MacNeil (Calgary, Alta./Spokane Chiefs), Olen Zellweger (Fort Saskatchewan, Alta./Everett Silvertips), Tyson Laventure (Lloydminster, Alta./Prince Albert Raiders), and Zack Stringer (Lethbridge, Alta./Lethbridge Hurricanes) each had a goal and an assist. Marc Lajoie (St. Albert, Alta./Tri-City Americans) added the other goal for his province in the rout. Leading 1-0 after 20 minutes, Alberta erupted for eight goals in the second period. Zack Ostapchuk (St. Albert, Alta./Vancouver Giants) contributed three assists and Brett Hyland (Edmonton, Alta./Brandon Wheat Kings) had a pair of helpers. Kai Uchacz (De Winton, Alta./Seattle Thunderbirds), Colton Dach (Fort Saskatchewan, Alta./Saskatoon Blades), Corson Ceulemans (Beaumont, Alta./Moose Jaw Warriors), Jayden Grubbe (Calgary, Alta./Red Deer Rebels), and Keagan Slaney (Airdrie, Alta./Edmonton Oil Kings) each had a single assist in the win. Dawson Pasternak (Winnipeg, Man./Portland Winterhawks) had a pair of goals and four points Friday as Manitoba claimed fifth place at the Canada Winter Games with a 7-5 win over Nova Scotia. 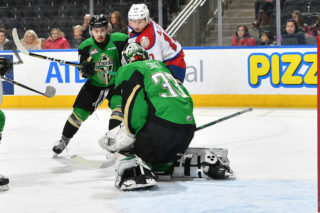 Conner Roulette (Winnipeg, Man./Seattle Thunderbirds) and Eric Alarie (Winnipeg, Man./Moose Jaw Warriors) contributed a goal and two assists each. Captain Carson Lambos (Winnipeg, Man./Kootenay ICE) had a goal and an assist. Leading 2-1 after 20 minutes, Manitoba scored twice in the second and three times in the third. Aidan Brook (Roblin, Man./Medicine Hat Tigers) and Hunter Wallace (Oak Lake, Man./Brandon Wheat Kings) also scored. 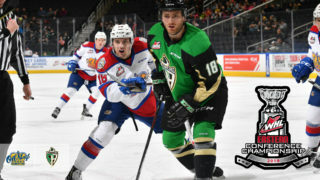 Tayem Gislason (Winnipeg, Man./Prince Albert Raiders), Rory Neill (Winnipeg, Man./Calgary Hitmen), Roux Bazin (Treherne, Man./Victoria Royals), Cabrel LaBossière (Lorette, Man./Brandon Wheat Kings), and Conor Geekie each had a single assist in the win. Jayden Catellier (St. Pierre, Man./Kamloops Blazers) stopped 24 shots for the win. Finlay Williams (North Vancouver, B.C./Swift Current Broncos) had a pair of goals and four points Friday as British Columbia closed out their Canada Winter Games experience with a 7-2 win over New Brunswick to earn seventh place. B.C. scored five goals in the second period after a scoreless first to take control of the game, adding two more in the third. Thomas Milic (Coquitlam, B.C./Seattle Thunderbirds) stopped 29 shots for the victory. 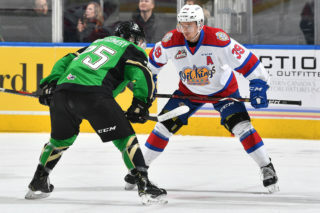 Matthew Seminoff (Coquitlam, B.C./Kamloops Blazers) had a pair of goals while Carson Latimer (Surrey, B.C./Edmonton Oil Kings) and Michael Abgrall (Richmond, B.C./Edmonton Oil Kings) contributed a goal and an assist each. Cage Newans (Qualicum Beach, B.C./Victoria Royals) also scored for B.C. Tyson Galloway (Kamloops, B.C./Calgary Hitmen), Kobe Verbicky (Victoria, B.C./Edmonton Oil Kings), Logan Stankoven (Kamloops B.C./Kamloops Blazers), and Trevor Wong (Vancouver, B.C./Kelowna Rockets) each contributed a single assist in the win. B.C.’s Logan Stankoven and Alberta’s Dylan Guenther finished tied for fifth in scoring for the tournament, leading all WHL prospects. Stankoven recorded 13 points (6G-7A) while Guenther had 13 points (4G-9A) as well. 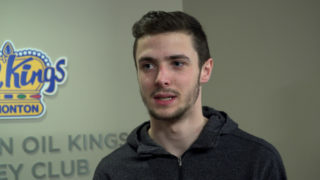 Samuel Schofield (Yellowknife, NWT/Swift Current Broncos) had 12 points (6G-6A) while Dawson Pasternak had 10 points (4G-6A), tied with B.C.’s Trevor Wong, who had 10 points (3G-7A) himself in the short tournament.